Boeing and Embraer have designed a new airliner centered around providing more space, plain and simple. The plain plane prides itself on its improved efficiency in all regards. The E2 family consists of three new planes, the E-175, the E-190, and the E-195, and there is a high degree of commonality between the three to reduce the spare parts requirement for each plane, and each one requires similar same ground support equipment, and allows for simple and streamlined training for the whole family. The planes all have electronic flight bags installed so that the pilots can always have access to diagnostics to ensure the aircraft is operating at peak efficiency. In addition, each flyer is built to optimize fuel burn and reduce external noise and emissions. You know what that means, those of you who live near an airport can sleep soundly with the new QUIET E2!!! The plane prides itself on its award winning cabin. Featuring no middle seats, larger windows, and carry-on compartments with greater volume, the cabins of the E2 family are designed to give the feeling of an unprecedented amount of personal space. The cabin is allegedly designed with crew efficiency in mind, meaning even the pilots have been blessed with better ergonomics for a minimized workload. The new plane is even capable of traveling incredible distances with a maximum passenger group, approximately 3,373 miles without stopping to refuel! I think the best feature of these new planes are the slightly obnoxious but lovable nose design of the spooky shark. 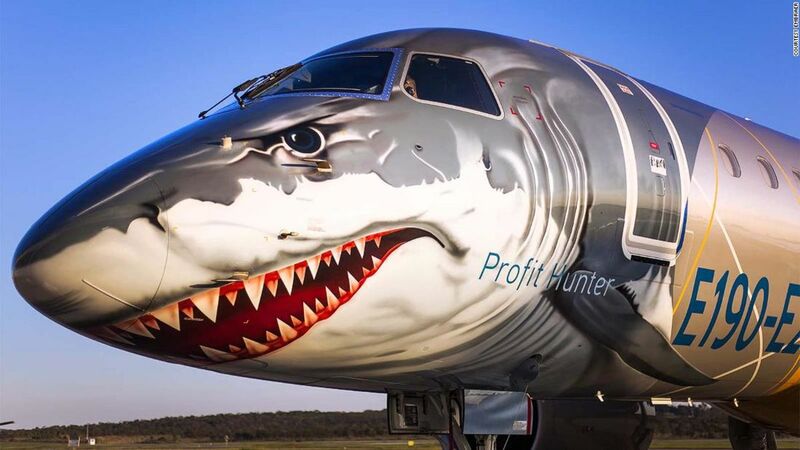 The maiden aircraft, nicknamed Profit Hunter, is currently flying around the world to show airliners the flexibility of this alleged perfect plane! So if a tornado starts up while this plane is flying, would it be a sharknado?